With 38 coastal countries and a wealth of offshore islands, Africa is full of opportunities for the adventurous surfer. South Africa is undoubtedly the continent’s best known surf destination, with world-class waves in major cities like Durban, Cape Town and Jeffreys Bay (to name a few). Further north, a plethora of secret surf spots await, from the remote, isolated shores of Namibia’s Skeleton Coast to tropical breaks in Liberia and Senegal. In this article, we take a look at a few of the best surf destinations that Africa has to offer. Quick Tip: Before planning your trip, make sure to check visa and vaccination requirements for your chosen destination. Located 50 miles (85 kilometers) south of Port Elizabeth on South Africa’s beautiful east coast, Jeffreys Bay (or J-Bay as it’s known locally) is arguably the most famous surf destination on the continent. Its most iconic break is Supertubes, a 4-8 foot right-hander with several classic barrelling sections. Every July, Supertubes hosts the J-Bay Open, a World Surf League event that attracts some of the best names in the business (including Mick Fanning, who famously fought off a great white here in 2015). A southwest wind is best for Supertubes, although visitors should be aware that the wave can get crowded and is fiercely protected by local surfers. Other less crowded spots include out-of-town Albatross and Kitchen Window, or Kitchens. The best season for surfing at Jeffreys is during the South African winter (June to September). Tiny N’Gor Island lies a few hundred meters off the Cap-Vert peninsula, near the Senegalese capital of Dakar. It’s home to the most famous surf break in the country — the N’Gor Right. Known for its consistency, this epic wave featured in the iconic 1964 surf movie "The Endless Summer;" but despite its legendary status, it remains relatively uncrowded. The line-up can be easily accessed via dug-out canoe, and N’Gor Island Surf Camp provides affordable accommodation, meals, local guides and surf lessons. Locals here are renowned for being friendly, and the island itself is a paradise idyll well worth exploring in between surf sessions. For the biggest waves, travel to N’Gor Island between November and March. August and September are less gnarly, but more reliable. Praia do Tofo is a backpacker’s idyll located 15 miles (25 kilometers) east of Inhambane. The most famous surf spot is Tofinho Point, a right-hand reef break found at the southern end of Tofo’s eastward beach. It’s consistent, and challenging enough to keep serious surfers on their toes. Beginners should tackle the break on the main beach instead. Tofo’s charms are manifold. Prices are cheap, the locals are welcoming and the water’s warm. Local operators like The Surf Shack offer rental equipment and surf lessons, while the area’s pristine reefs provide world-class diving. The best season for surfing is June to August — months that coincide with the annual humpback whale migration. Don’t be surprised if you catch sight of these friendly giants on backline. A half-hour drive north of Agadir on Morocco’s west coast, Taghazout is a small fishing village made famous by its perfect surf breaks. There’s something for everyone here, from challenging point breaks to laid-back beach breaks. Perhaps the most famous spot is Anchor Point, a right-hander that has been known to run for 1,650 feet (500 meters) on a large northwest swell. Boilers is the region’s most challenging break, while Immesouane offers one of the longest rides in Morocco. The latter is considered suitable for beginners. There are several operators in Taghazout offering lessons, accommodation and professional guides. Choose Surf Berbere for the ultimate surf and yoga retreat. The best season for surfing in Taghazout is September to April. Civil war and the 2014 Ebola epidemic have kept Liberia off the tourist map. As a result, this West African nation is home to the continent’s best-kept surfing secret. With the Ebola threat over, it’s the ultimate off-the-beaten-track destination for adventurous types in search of empty line-ups. Located three hours’ drive northwest of Monrovia, Robertsport is home to some of the best breaks in the country. Kwepunha Retreat is the ideal surfer’s base, offering walking distance proximity to the area’s top spots. The most famous is Cottons — a long, often hollow wave with excellent tube-riding potential. Fisherman’s break is ideal for long-boarders, while Shipwrecks is a reliable spot when other breaks aren’t operating. For peak consistency, travel between April and August. Some of Madagascar’s best surf spots are found near Anakao, a village located just south of Toliara in the southwest of the country. Here, the waves break several kilometers offshore on an outer reef. You’ll need to arrange a tow to reach them, but once you get there, the non-existent line-up makes the effort worthwhile. The most notorious break is Flameballs, a left-hander that can reach up to 8 foot on a good day. With stand-up barrels, it’s not for the faint-hearted. Less experienced surfers should try right-hander Jelly Babies for a longer, more friendly ride. Anakao’s offshore breaks are still largely unexplored, giving you the chance to scout out new spots. Although Madagascar has a reputation for sharks, only three attacks have been recorded since 1828. 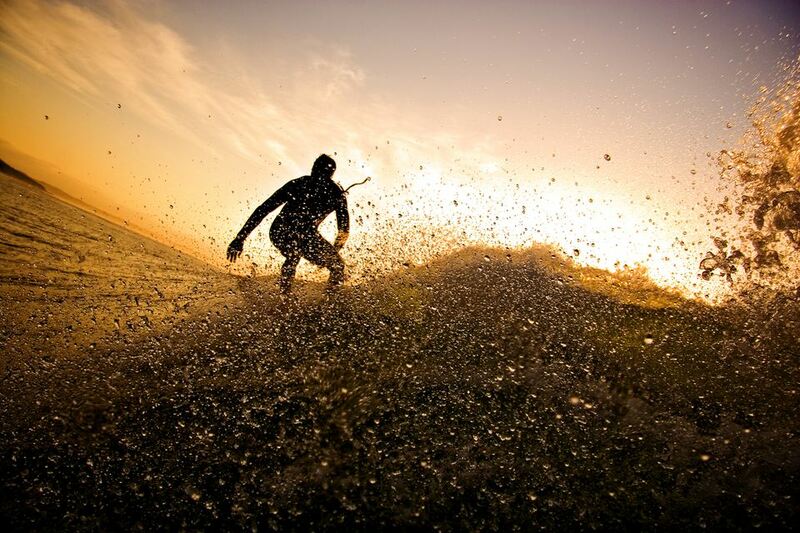 Easily accessible and blessed with first-world infrastructure, Durban is Africa’s surfing capital. As a general rule, the biggest swells are found to the north of the Golden Mile, at sites like North Beach, Bay of Plenty and Dairy Beach. Of these, the most famous is New Pier, with its left and right-hand breaks. However, this spot is suitable for experienced surfers only and known for its territorial locals. For beginners, the best waves are found further south, in front of uShaka Marine World and around Vetch’s Pier. South of the harbor, Ansteys Beach and Cave Rock both offer pro-worthy waves. With so many spots to choose from, Durban offers year-round surfing. Warm water, glorious sunshine and a wealth of bars and restaurants for post-surf partying add to the attraction. Located just across the border from South Africa, Ponta do Ouro is a popular party destination for vacationing South Africans during the December holidays. If you travel during the southern hemisphere winter, however, you're likely to get the town's right-hand point break (arguably the most famous in Mozambique) virtually to yourself. In optimum conditions, the right-hander rivals Jeffrey's Bay and can be ridden for almost a kilometer, all the way from the point to the beach. As an added bonus, Ponta is home to resident pods of bottlenose dolphin that often join surfers on backline. When you tire of surfing, there are a myriad other ways to enjoy the ocean, from dolphin encounters to scuba diving. Swells hit the Ponta coast from February to October, but June to August is the peak time for the best waves. Located on the barren shores of Namibia’s Skeleton Coast, Skeleton Bay became the stuff of surfing legend in 2008. After a Surfing Magazine contest discovered the bay on Google Earth, American pro Corey Lopez rode the bay’s left-hand wave for over 2 kilometers — establishing this as one of the longest barrel rides in the world. Skeleton Bay is reserved for the highly experienced and the unwaveringly dedicated, however. The water is freezing, the tubes are relentless, the current is fierce and when it’s going off, the wave can be crowded. The bay itself is intimidatingly remote, and the break only occurs a few times a year. However, if you get it right, this is one of the most rewarding waves on the continent. The best season is May to September. If the idea of stepping off the beaten track appeals, Ghana's unofficial surfing capital, Busua, is another worthwhile choice. Situated an hour's drive west of Takoradi, the backpacker town and its waves were featured in "The Endless Summer;" and yet, it still qualifies as a secret spot for those in the know. A scattering of surf shops (including Mr. Brights and Ahanta Waves) offer lessons, equipment hire and bespoke surf safaris, but chances are you'll be one of only a few intrepid surfers in the water on any given day. The waves off Busua itself are perfect for beginners and intermediates, with a fast, hollow beach break and a gentle right-hand point break. For a more challenging ride, explore the point break at nearby Dixcove or the right-hander at Cape Three Points. April to August is optimum surfing season.